Yesterday from the summit of Mt. Washington we could see but not hear the helicopters circling the Lakes of the Clouds Hut. I had never seen a hut airlift from above before, and the whirling striped blades of the ships made them look like hovering dragonflies. 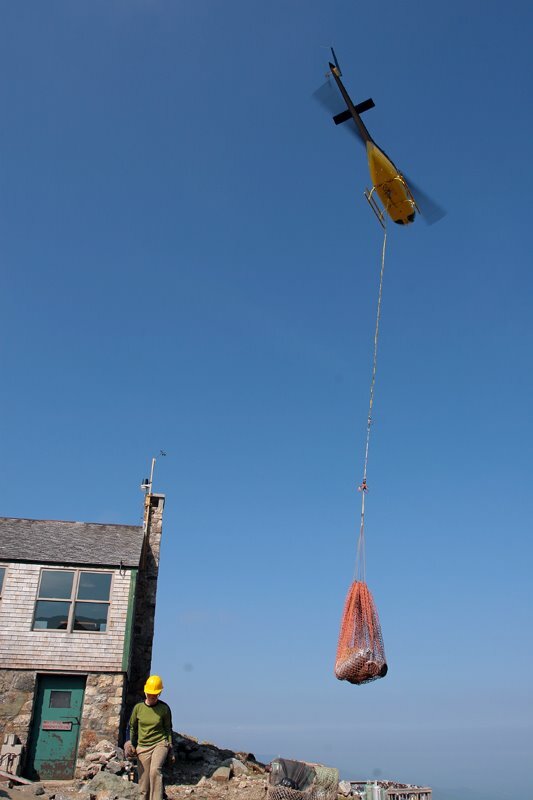 With the windows of good weather closing the helicopter company put two pilots and helicopters on the Lakes airlift. Caitlin, Ana and a high school senior from Maine named Anthony (he was doing a day of job shadowing with me) ran down the mile and a half of rock to the hut to help. 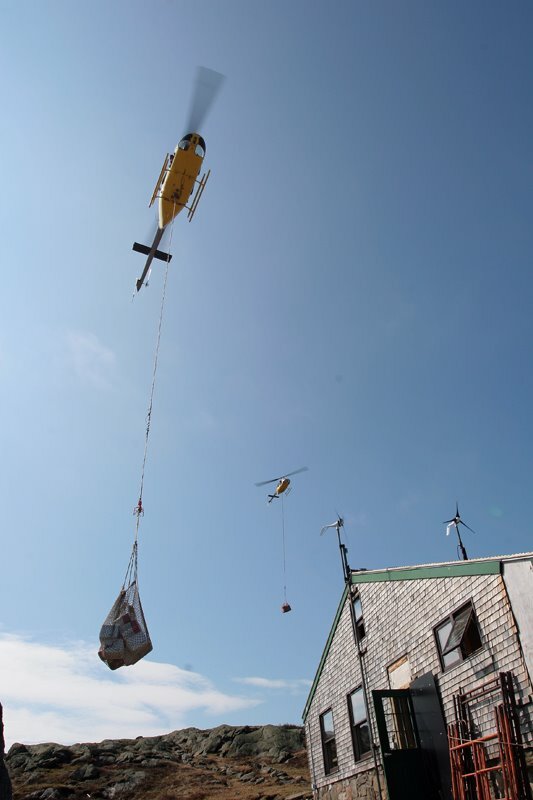 When we arrived the two helicopters had just dropped two nets, 1,600 pounds of food, outside the crew door of the hut. Brian Quarrier, a first-year crewman from New Hampshire was at the nets, tossing 60-lb boxes of canned tomatoes through the open door. Inside the hut the Lakes crew formed a fireline up to attic and was passing boxes in a frenzy as if the nets were a pet shelter on fire and the boxes were paraplegic cats. Here I also saw something I had never seen. The weather at Lakes was as warm as it ever gets, in the low 60’s, and the crew was sweating right through their heavy double-kneed canvas Carhartt work pants. Shivering at Lakes is common, sweating is not. The rest of us soon overheated too. With two ships flying there was just barely enough time to clear the landing zone before another net came in. 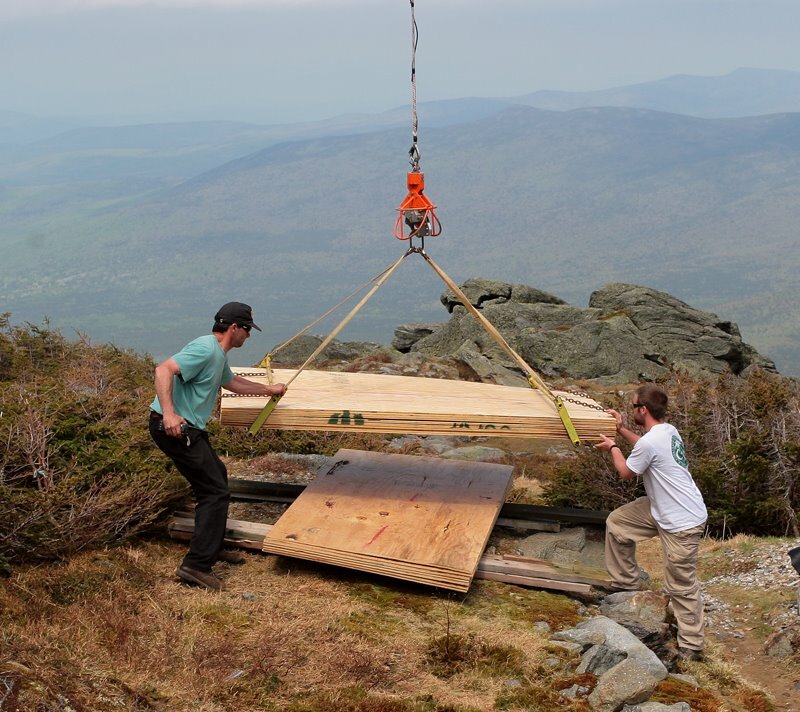 Adding to the challenge Lakes received further renovation this spring. Thanks to a generous donor the hut has new mattresses, new blankets, and new pillows. Each bunk now also has a small shelf and multiple hooks. However, all the bedding arrived in the midst of the food. One helicopter began dropping mattresses on the far side of the hut, while the other continued dropping food at the crew door. Now half the crew worked to move 110 mattresses inside, and bulky 70-pound boxes of wool blankets. The boxes of pillows felt like containers of air by comparison. This continued for 3 hours. 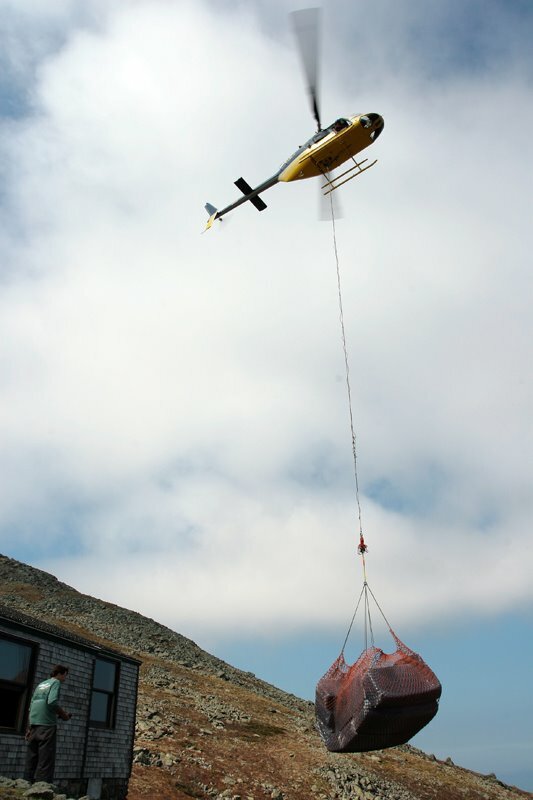 On each trip back down to the valley the helicopters lifted out construction material, human waste, and cardboard. A bit after noon one helicopter landed and picked up the CC top crew. They disappeared into clouds to the west, headed for Zealand. The Lakes crew sat down to a quick lunch. The following day their first guests would arrive, and the hut was still a long way from ready. There was still a day’s worth of work organizing and cleaning the hut. 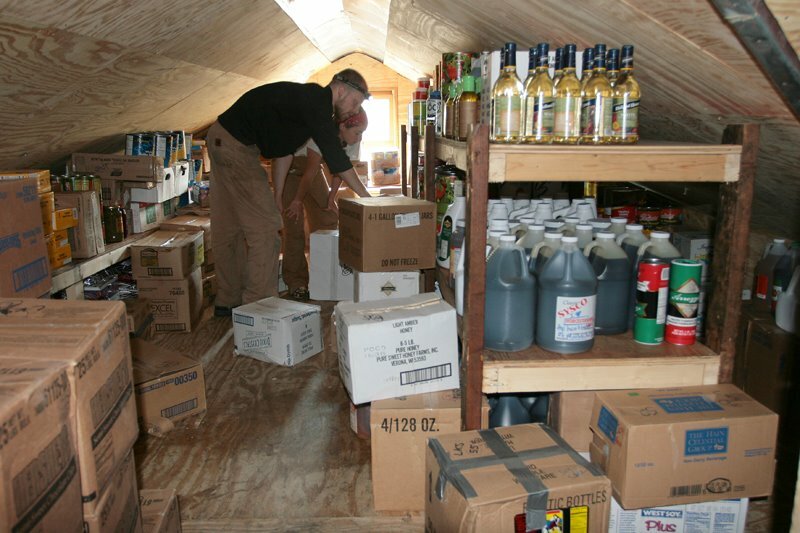 The hut store had to be organized and hundreds of t-shirts counted and folded. The bunkrooms were waiting to be assembled and swept. As Caitlin and I hiked back to the summit we thought about our own seasons spent opening Lakes. Each year has its own particular challenges. My first season the hut was still buried under snow and we could walk onto the roof where the front door was. We spent two days shoveling out the windows and doors. Caitlin once spent three days with her crew and putty knives chiseling off varnish from all the hut walls. It had been applied in the fall and started flaking off in the winter. These are the experiences that form the hut crews for the bigger challenges in the summer to come.